The Rosé Mansion is an indoor pink-wine theme park slated to open July 12 for three months in midtown Manhattan. Rosé mania has reached a new milestone. This time you can even Google Map it. The address is 445 5th Ave., New York. That’s about to become the home of Rosé Mansion, an indoor pink-wine theme park slated to open July 12 for three months in midtown Manhattan. More fashionably billed as an interactive pop-up exhibit (with a big wine bar and gift shop), the two-storey former retail space will feature 14 rooms devoted to various themes in the history, science and culture of what has become the unofficial wine colour of millennials. The education in fact starts at the beginning. Each souvenir tasting glass (included with the admission price) is doled out with a sheet of stickers inside that are each tinted the colour of a popular rosé grape variety and labelled with the grape’s name, such as pinot noir, syrah and carignan. As visitors stroll into the next room, which is completely painted and furnished in white, they are invited to paste the stickers on the wall to create a sort of crowd-sourced mosaic. “People can say to themselves, oh, red wine grapes, that’s where rosé comes from,” Balliet said. Tickets, priced at US$35 to US$45, include eight samples and post-tour access to a tasting lounge that Balliet calls “the coolest rosé bar in the U.S.,” with more than 100 selections from every major region and in every style, from super-dark, virtual-red rosés to today’s highly fashionable, barely stained peachy-pink wines. That to me is the attraction’s encouraging signal as far as rosé-appreciation goes. 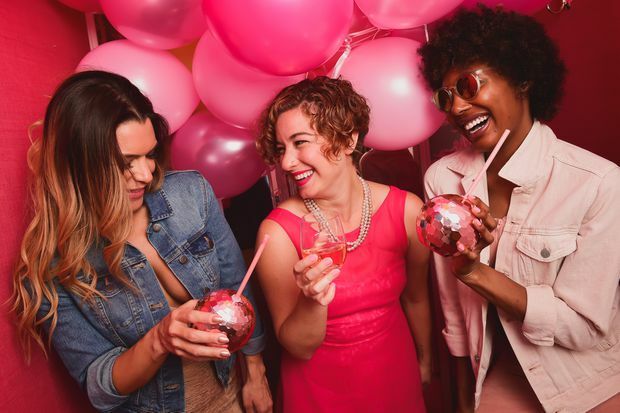 New wine drinkers, or at least presumably many of them, are growing hip to the fact that pink is more than just the cheap-and-cheerful eye candy of the oenological world. Rosé is not a “style” of wine or narrow category. The regional selection and range of flavours is vast. Which is one reason why, having already weighed in this season with a selection of pink wines, I’m offering a bunch more. The other reason: The parade of newly available rosés never stops, especially in summer. For a rosé, this does qualify as expensive. But it doesn’t begin to look outrageous when compared with fine white wines such as those from Burgundy or Napa Valley. If you insist that pink wine is capable merely of simple refreshment, then by all means stay away. This is as much brain candy as mouth or eye candy, hailing from the great rosé district of Bandol in Provence. Fermented with wild yeasts, it’s a blend of mourvèdre, grenache and cinsault, medium-bodied and sensuously fleshy, with notes of pear and melon and soft yet smartly tuned acidity. Available in Ontario. This is the second rosé vintage for an Okanagan winery best known for the cult red Nota Bene. Winemaker Graham Pierce and winegrower Steve Carberry nailed it in 2017. The wine is cherry pink in colour, dry yet silky, with pure cherry-like flavour in the lead and green apple for support. Juicy, cheerful and deftly balanced. Available direct through blackhillswinery.com. The pretty strawberry-pink colour hints at the uncanny strawberry flavour in the bottle. A superbly balanced, lip-smacking dry wine, it also offers a note of refreshing watermelon. Available direct from the British Columbia estate through spearheadwinery.com. Note the bottle volume; it’s 1.5 litres, or twice the size of a standard bottle. So, the price is not as steep as it might first appear. From Provence, the wine is very pale pink and instantly comes across with the taste of red-delicious apple. More corpulent than the colour would suggest, it delivers nuances of flowers and candied berry, too, with excellent balance and length. Available in Ontario at the above price, $19.95 in Quebec for a regular-size bottle. Cherry-pink in colour, this delivers good weight and density, with sweetly ripe cherry-cranberry fruit lifted by tangy acidity for a fully dry finish. Mostly gamay with some pinot noir. Generous enough to pair well with ham or pork tenderloin or pork chops, even sweet barbecued ribs. Available direct from the Prince Edward County winery through rosehallrun.com. This comes from a relatively new Niagara estate, but a veteran and noted, chief winemaker, Thomas Bachelder. It’s made from pinot noir and is medium strawberry pink in colour, dry yet with satisfyingly fleshy mid-palate weight and a subtly sweet ripeness, with flavours of creamy strawberry shortcake and raspberry lit up by an electric charge of acidity. Available direct through queylus.shop. Fetching colour: pale pink with a frosty glow. The wine is made from gamay (50 per cent) with pinot noir and a splash of pinot gris. It’s light-medium-bodied, dry and glossy in texture, with ripe strawberry-peach fruit and just the right snap of acidity. Good length and good price. Available at BC Liquor Stores at the above price, various prices in Alberta, $19.95 in Ontario, $19.29 in New Brunswick. Substantial in weight, as the saturated colour might suggest, this is round and ever-so-slightly sweet, though it could pass as technically dry. A blend of 72-per-cent syrah with 28-per-cent malbec, it’s plump with mixed-berry flavour and a fresh-grape quality as well as a whisper of spice. Although it’s vegan as well as organic, it could pair well with pork or salmon on the grill as well as spicy sriracha-soy-grilled tofu. Available direct from the British Columbia winery through summerhill.bc.ca. Very pale pink and very crisp-dry, this rosado from Rioja is made with three of the region’s classic grapes, garnacha (a.k.a. grenache), tempranillo and viura. Tart peach, cranberry and bitter-lemon-rind flavours are carried on a slightly, and pleasantly, chalky texture. Delicate and invigorating. Good value. Available in Ontario at the above price, $20.99 in British Columbia, various prices in Alberta. Deep strawberry-pink in colour, this is an unusual – or, shall we say twisted? – blend of mainly pinot noir with two aromatic white grapes, gewurztraminer and riesling. It’s medium-bodied, with a fresh, minty overtone to go along with a soft-smooth texture and flavours of sweet peach, apricot nectar and strawberry. Thick and faintly sticky, in a good way. Available in Ontario.